Pacers star forward Paul George participated in a full practice with his team for the first time since gruesomely snapping his leg in a FIBA World Cup scrimmage this past summer. There's still no official timetable for when he might be ready to play in a game, but it is possible that he'll be back on the floor before the end of this season. 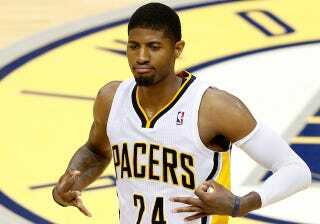 "Paul is not going to be out there unless he's Paul George," Vogel said. "He's eager to get back on the court, but not before he's ready. Once he's mentally cleared to play in a game, he's still got to be ready to (actually) play in a game." But George was able to pass all of his cutting, running, and jumping tests, and the Pacers have good reason to try and get him back on the court as soon as possible. That's because the dreadfulness of the Eastern Conference has left every team aside from Orlando, New York, and Philadelphia within striking distance of the playoffs. The Pacers are just a game back of the eighth seed at 23-34, and an even higher spot could become attainable depending on how far the Bosh-less Heat and Rose-less Bulls end up falling. Nobody has paid a lick of attention to the Pacers this year, but they've won seven of their last 10 games and still have a top-10 defensive rating. Throw Paul George into the mix, and the Pacers' supposedly lost season might suddenly be headed for a brighter end.